Well winter is finally here I guess. I was hoping we would escape the sub zero temperatures and big outflow winds but that is exactly what we have lined up for this weekend, even a freezing spray warning for today. If you are going to head out, make sure to dress extra warm and be safe. If you are looking to keep warm, maybe stay off the water and head to the boat show! The fishing this past week was pretty good. It has been the usual pattern of putting in your time and getting your shots at fish, usually around the tide change. Howe Sound has been producing some fish and so has Vancouver Harbour around the Bell Buoy, Freighters, and Cap Mouth. 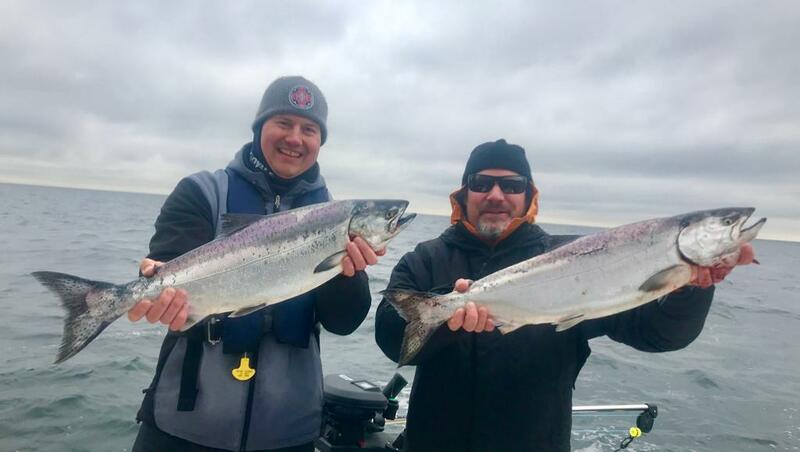 A couple of nice ones from Howe Sound last week. There has been a lot of bait around the Bell Buoy and some nice chinook too. Productive flashers this week were a mix of black blades, UV purple blades, and chartreuse or green blades, all with glow tape. The brighter blades did out produce on one day when it was pretty dark out all day. For black blades try CB55, PA Custom black (aka Black Mamba). For UV purple blades, the Phantom has been deadly. For green or chartreuse blades the STS, BC, Madi, and Lemon Lime have all been doing well as has our PA Custom in those colours. The fish we cleaned has small herring inside, so the 3.0 and 3.5 spoons have been good in G-Force an Kingfisher. Skinny G were also good this week. Irish Cream, Outfitter, Herring Aide, were all working. Prawning continues to be good as well and crabbing is still slow.